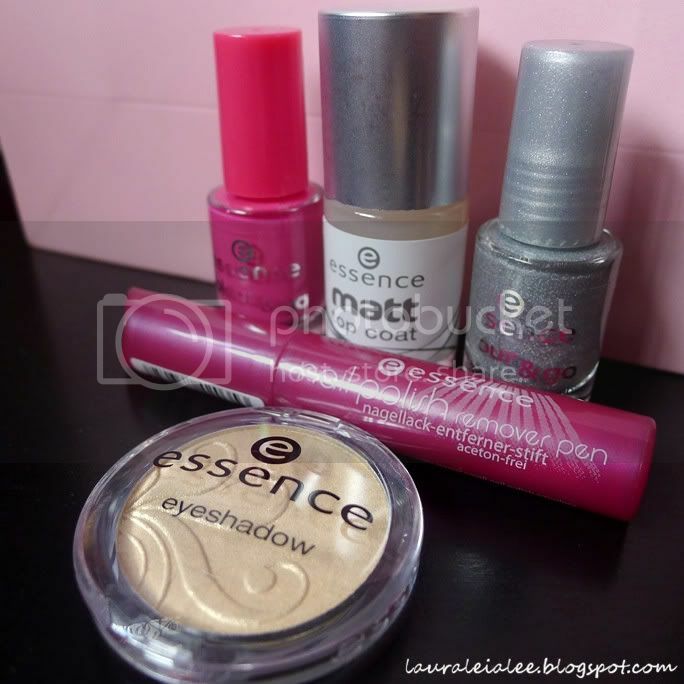 Today I'm going to do a small review on 2 Essence nail polishes (and a swatch of their powder eyeshadow). I have often seen Essence nail polish swatches on various blogs but since it was not available in Malaysia, I could only drool at them in front of the laptop. 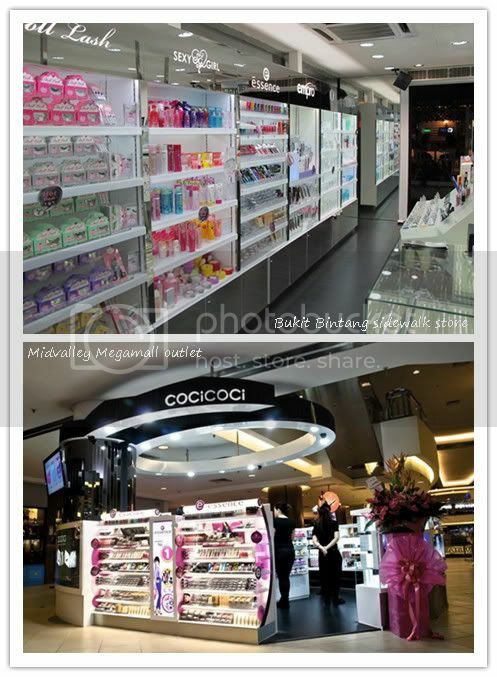 Update (10th September 2012): Essence cosmetics can be found in Watsons at the following locations - Sunway Pyramid, The Mines, Plaza Metro Kajang, Sungei Wang Plaza, Alpha Angle Shopping, PJ Old Town, Carrefour Kepong, Alamanda Shopping Centre, Taman Maluri Cheras, Endah Parade, Jusco Cheras Selatan, Berjaya Times Square, Cheras Leisure Mall & Tesco Ampang. The CociCoci outlets in Midvalley and Bukit Bintang have closed. 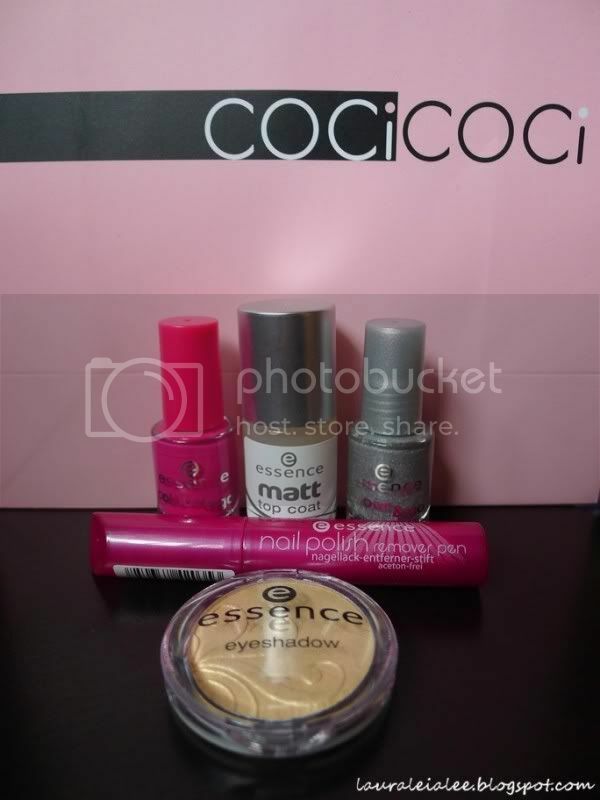 These are my recent Essence purchases from COCiCOCi. As you can see, all the items are very pocket-friendly. The 'Colour & Go' collection is the most affordable and comes in a wide selection of fun colours. Even better, the colours are really opaque, so if you have shorter nails, a single coat is enough. Of course, you can always apply 2 coats for a more even finish and to cover up any VNL (visible nail line) if your nails are longer. The swatches in the photo above are all done with 2 coats, and a layer of matte topcoat for the middle and pinky fingers. As you can see, Ultimate Pink is a glossy deep pink colour, while Can't Cheat On Me is a clear base with lots of grey-ish holographic micro-glitter. The nail line is very visible for Can't Cheat On Me, so I was pleasantly surprised at the effect of a matte topcoat on it, which makes it much less visible and gives it a frosty, shimmery look. ♥ I think Ultimate Pink is better left as it is, a glossy nail polish, because it pales in comparison to OPI's La-Pazitively Hot (Matte). 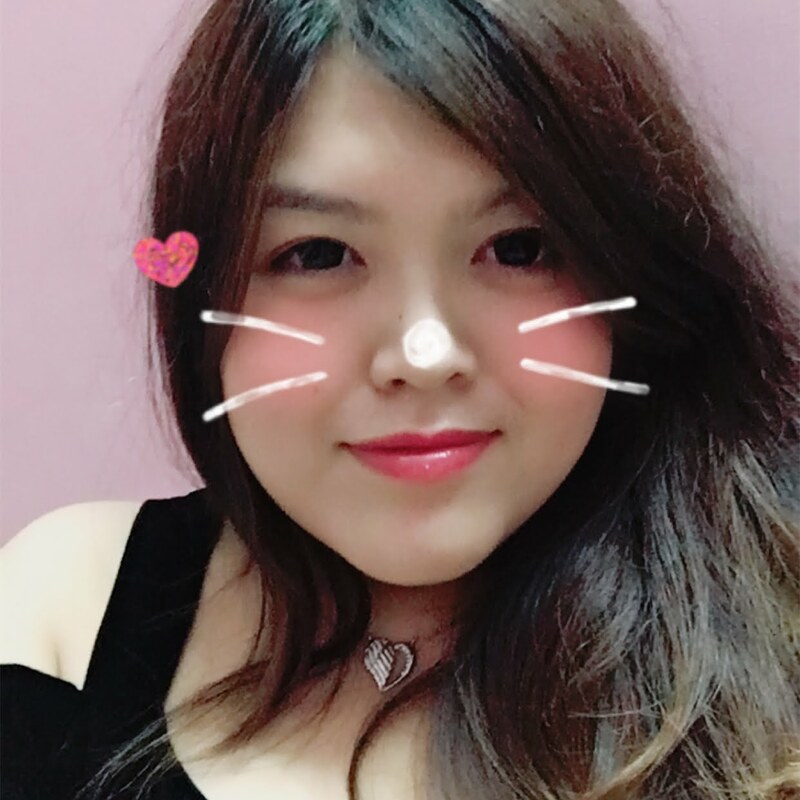 I also purchased their powder eyeshadow in #24 Love Me, which is a shimmery gold shade, in the hopes of it being a (temporary) substitute for the Dolly Wink Cream Eyeshadow mentioned in my previous post. Priced at RM 7.90, I reasoned that it could be worth a try. I must say, it looked better when I swatched it on the back of my hand while in the store. 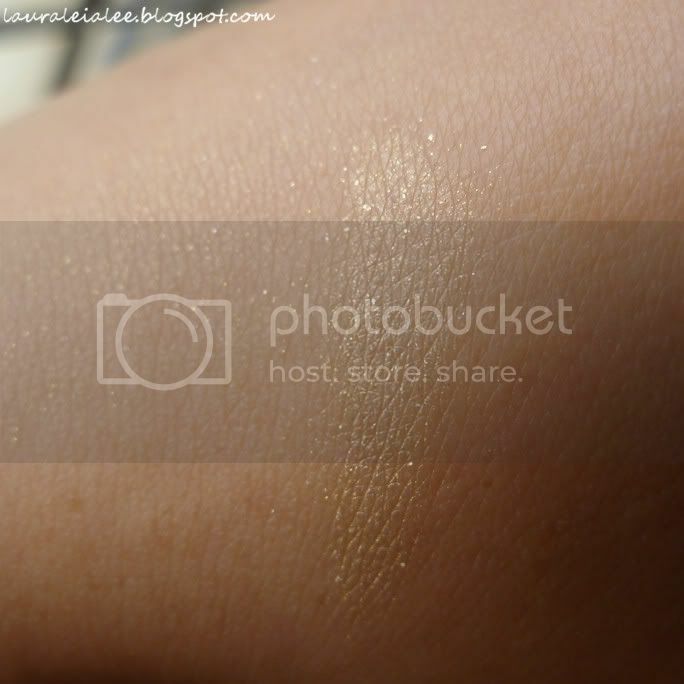 Swatching it for the second time at home, I found that it is not very pigmented and the colour does not show up very well, even in direct sunlight, even though there is some reasonably visible gold shimmer when blended. Looks like I'll only be using this eyeshadow as a base/highlight shade. 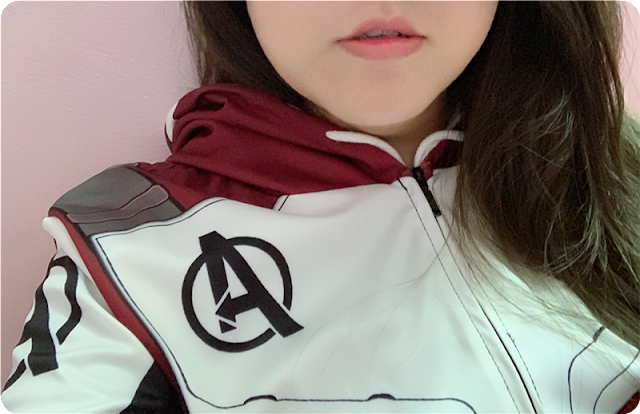 ✓ Pros: Very affordable price, opaque in one coat, quick drying (if you do 1 coat), comes in a wide variety of fun colours. ✗ Cons: None? I love them, and would go and buy more! ✓ Pros: Cheap, dries fast. ✗ Cons: Not really a 'matte' finish., more of a satin-matte (to me, anyway). ✓ Pros: Cheap, large selection of colours, available in matte, shimmer and creamy textures. ✗ Cons: Slightly too hard and powdery, not very pigmented. I highly recommend their polish polish, as it is very affordable and high quality, not to mention that you can choose from so many colours. Besides the 'Colour & Go' collection, they also have the 'Multi Dimension XXXL Shine' series, as well as their newest 'Metallics Magnetic' nail polish collection. That's the one I am most eager to try, because I am absolutely fascinated by the idea of using magnets to create nail art after reading about these nail polishes on All Lacquered Up. Well, that's all for today. 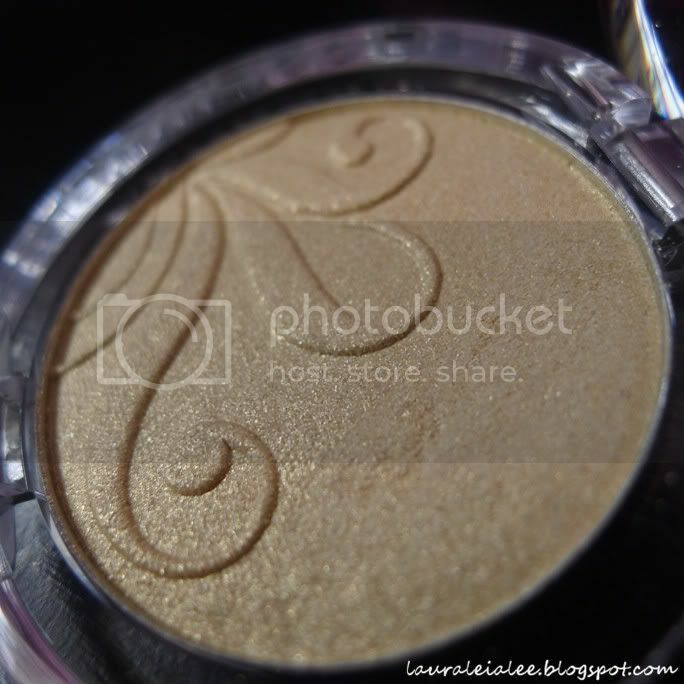 Hope you liked my review and swatches, and do leave a comment. :) Thanks! love the nail colours...it's shimmering. Yup! :) Best of all, they don't look messy even if you paint of out the (nail) line and get nail polish on your skin, haha! The range seems pretty affordable and the nail polish shades looks interesting. Must check this out the next time I'm in Mid-Valley. @synrol Yes, it's very nice and not too shocking. :D I gave it away to a relative last week, so I had to go out and buy it again for myself, haha! Gold/yellow tone doesn't suit me. :( I also just bought the silver magnetic polish but didn't buy the magnet (coz i kiamsiap LOL). I think you have to hold it really close to the freshly-applied nail polish to get the pattern effect.